When considering country of birth, 84.6% of Sandwell residents were born in the United Kingdom or Ireland, compared with 87.3% nationally. One in eight Sandwell residents were born in a country outside the European Union. Only 1.5% of Sandwell's residents have lived in the United Kingdom for less than 2 years and a further 2.3% have lived in the UK for between 2 and 5 years. Over 95% of Sandwell's White residents were born in the United Kingdom or Ireland, whilst 3.6% were born in EU Accession countries (which joined the EU between April 2001 and March 2011). There is some variation by ward - only 76.3% of White residents in Soho & Victoria were born in the UK or Ireland, and 80.7% of White residents in West Bromwich Central. A relatively large proportion of White residents in West Bromwich Central, Soho & Victoria and St. Pauls were born in EU Accession countries (17.7%, 17.1% and 10.7% respectively). 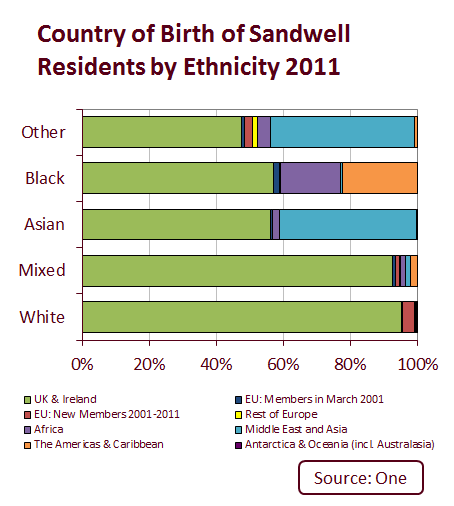 92.5% of Sandwell's mixed/multiple origin residents were born in the UK or Ireland. 56.1% of Asian residents in Sandwell were born in the UK or Ireland, whilst 41.1% were born in the Middle East or Asia. There is some variation by ward - 51.5% of Asian residents in Smethwick were born in the UK or Ireland, compared with 63.8% of Asian residents in Old Warley. 56.9% of Black residents in Sandwell were born in the UK or Ireland, whilst 22.4% were born in the Americas or Caribbean, and 18% in Africa. Country of birth of Black residents does vary by ward. A third of Black residents in West Bromwich Central were born in the Americas or Caribbean, whilst over a third in Cradley Heath & Old Hill were born in Africa. 42.9% of residents of "Other" origin in Sandwell were born in the Middle East and Asia. Detailed country of birth data can be downloaded here for Sandwell wards. The 2011 Census collected information for the first time on main language and English language skills. It should be noted that people who did not report English as a main language may be fluent English speakers. In Sandwell overall, 64.5% of residents whose main language is not English, can speak English well or very well. Only a very small proportion of residents cannot speak English at all (0.8% of all residents aged 3 & over). 88% of Sandwell residents speak English as their main language, compared to 92.3% nationally. This proportion varies by ward, and in five wards less than 80% of residents speak English as their main language. In St. Pauls ward, 67.8% of residents speak English as their main language, and 67.4% in Soho & Victoria. 7.4% of Sandwell residents speak a South Asian language as their main language. Over a quarter of St. Pauls residents speak a South Asian language overall. 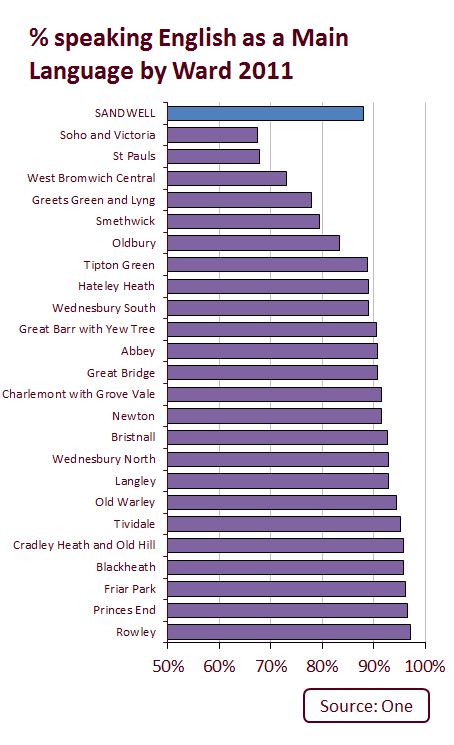 13.3% of residents in St. Pauls speak Panjabi, and 10.3% in Smethwick. 6.1% of St. Pauls residents speak Bengali as their main language and a further 4.6% speak Urdu. 8.7% of residents in West Bromwich Central speak another European Union language. In particular, 7.1% of residents speak Polish as their main language. 4.3% of those in Greets Green and Lyng speak Polish as their main language. More data on languages spoken by ward can be downloaded here, and detailed data for Sandwell is also available. In terms of religion, 55.2% of Sandwell residents are Christian, lower than the national average of 59.3%. This has fallen considerably since 2001, when 68.6% of Sandwell residents said they were Christian. Overall, 18.7% said they are not affiliated with any religion. 68.3% of Sandwell's White British residents are Christian, whilst 24.6% state they have no religion. White British residents in Abbey ward are most likely to say they have no religion (31.8%). Irish, Gypsy or Irish Traveller residents are far more likely to state they are Christian (84.3%), whilst only 8.4% have no religion. 3.9% of 'Other White' residents are Muslim - this rises to 12.5% in Soho & Victoria. Mixed groups are more likely to state they have no affiliation to a religion - a third overall say this, and this rises to 46.5% in Abbey ward. 14.4% of mixed origin residents in Soho & Victoria are Muslim. 39.8% of Asian residents in Sandwell are Sikh, and a further 36% are Muslim. Only 2.3% of Asian residents say they are not affiliated to any religion. Amongst Asian residents, there is variation by ward - in Princes End and Wednesbury South more than one in five Asian residents are Hindu. In contrast, there are five wards where more than half the Asian residents are Muslim - most notably Princes End (71.3%). In Charlemont with Grove Vale and Old Warley, over 60% of Asian residents are Sikh. 73.7% of Black residents in Sandwell are Christian, and only 10% are not affiliated to any religion. 21% of Black residents in Soho & Victoria are Muslim. 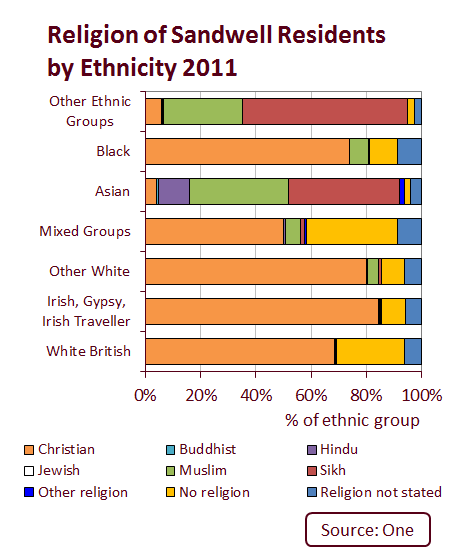 Detailed data on religion by ethnicity by ward can be downloaded here.